Champagne doesn’t have to be a “New Year only” beverage, we swear. While Champagne has certainly earned its “celebratory” connotation; it can be enjoyed just like your evening glass of beer or wine. All you’ve got to do is relinquish the associations and enjoy! Enjoyment comes much easier though, when you know how to pick the right bottle of Champagne. We know that most folks (only searching for Champagne on anniversaries and holidays) may not know what to look for when picking their bubbly. So, we’ve decided to aid in this endeavor and hopefully get you enjoying this sparkly bliss on a more frequent basis. Firstly, it is illegal to call your sparkling, alcoholic beverage “Champagne” if it does not come from the Champagne region of France. The French pioneered and lay stake to that claim long, long ago. Knowing this though, it’s fairly easy to weed out the genuine from the disingenuous. There is some speculation about the capitalization of the “C” in Champagne but we’d recommend just sticking to the legal rule of thumb: if it’s called “Champagne” it’s probably a safe bet. If you’re looking for a dryer Champagne look for the words “Extra Brut,” “Brut,” or “Extra Dry” on your bottle. These are Champagnes that are fermented with less sugar and therefore, have a bit of a dryer taste. In case you’re wondering, “Brut” in French means “raw” or “rough.” In a lot of ways, this makes sense! 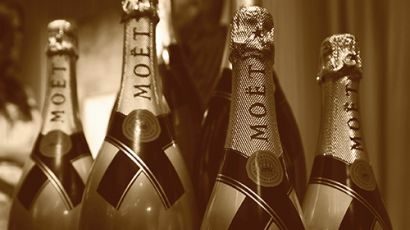 If your Champagne isn’t sweet, it’s not tarnished in any way. It is at its base form: raw. For those with a sweet seeking palate, it’s best to look for the words “Sec,” “Demi-Sec,” and “Doux”. While “sec” means “dry” in French, it is the middle of the road in terms of Champagne terminology. The law also stipulates that any bottle categorized as “vintage” must spend at least three years aging and fermenting. Similar to cheese, wine is better with age. For most vintners, the “vintage” represents some of their best grapes and their best blends. So, for the most part, you can count on the Champagne being pretty tasty if not a little more expensive. What’s great about vintage wines is that they store longer too! Vintage Champagne stays tasty and bubbly for up to ten years before opening, whereas your non-vintage gets about three years. Of course, this isn’t the end-all-be-all when it comes to Champagne selection. But, it certainly does help to know the details and begin experimenting on your own. So, if and when you do decide to drink outside the holiday box or bring a bottle as a gift, you’ll know what you’re doing!